A page of links to artists web sites all over the world. A page of links to more information about artists with web sites..
All Handmade Crafts and Decorated Eggs Art MJ Crafts Design Studio features unique handmade crafts, gifts, and decorated eggs (Eggypiece Art Collection.) Photo holders, handmade jewelry, pins, watches, and other crafts made out of mixed media. Caryn B. Davis Photography Exceptional Fine Art Photography. Her work is featured on the July 2003 cover of Zoom Magazine. "I think of myself as an anthropologist with a camera. I like to study in-depth other cultures and subcultures to gain a better understanding about the world around me. I combine documentary portraiture with fine art to create photo essays. I never tell my subjects how to pose. Rather, I let them find their own way in front of the camera so that their articulation or stance is a pure expression of who they are, and what they want to convey about themselves, without manipulation. In this regard, I am able to create a fine art portrait while maintaining "
Serena G. Bates. A graduate of the Lyme Academy of Fine Arts, Serena G. Bates has been a professional artist for the past decade. As an artist, she is specialized and accomplished in portrait and animal sculpture and works in mediums of stone, bronze, plaster, wax and clay. 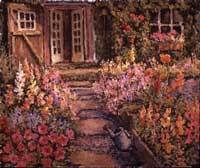 She also is well experienced in color and black and white mediums of pastel, oil & graphite. Serena shares her knowledge and expertise in these mediums with community members of all ages and often holds classes in her studio, as well as teaches outreach programs at area schools. Don Cadoret - Story Painter from Rhode Island. "For 35 years I've been telling stories with a paintbrush. Some of the stories are true recollections of growing up in New England, whereas others are glimpses of life today. Folk tales, political issues and historic landscapes are all a part of the stories I choose to paint." Erik Johnson, Scandinavian Photography Simply the best! Laura Williams Fine American Artist. On-line gallery. Elin Pendleton Fine American Artist. Julian Merro-Smith English painter living in Provence, France. Visit his open studio/gallery anytime of year. Jennifer Young's Art Gallery A gallery of expressive art- figurative, still life, and landscapes- by Jennifer Young. A visual artist from Richmond, VirginiaYoung creates unique, well-crafted, and vibrantly colored oil paintings and limited edition prints. Gerard Mineo - Family Portrait Artist Specializing in Soft Pastel, Portraits Drawn orPainted fromYour Photos or from Sitting. Nancy Pinney. The Pinney Gallery encompasses the virtual gallery for exhibiting Nancy Pinney's landscapes of her native Connecticut River Valley, and the love of her heritage captured in this recent exhibit of Irish paintings..... Along with fellow artist and travel companion Chris Karpinski, known for her landscapes of the New England Shore and Mountain Regions. Nancy and Chris have created a "Marvelously Cohesive Portrayal" of the wondrous Irish Landscape. One of a Kind Antiques. Amazing web site filled with thousands of priceless antique paintings. When people look at my abstract artworks I want them to experience resonance with Nature's relationships, fields and patterns. My emphasis is on sequence, structure and spin, metaphors for Nature's rhythms of creation and destruction. All works are permutations of these ideas varying in scale from hand held to room size. Simon Donikian painter of Queens, NY. We showed together back in 1990 or so. The Van Gogh of Queens! Silvana Brunotti Oil Paintings - Landscapes Painting - Artist Painter Original Oil Paintings by the Contemporary Italian Painter Silvana Brunotti. Pictures of Rome, Italy Landscapes, Still life painting, Watercolors and mixed techiniques. ZSUZANNA VARGA SZEGEDI A talented Hungarian artist whose objective is "To work in an artistic environment where I can optimize the use of my conceptual design skills and aesthetic senses as a visual communications illustrator and graphic, multimedia, or Web designer." Oil Painting On Canvas. Mekdam Nima is a Canadian artist. Mekdam s Oil Painting is the art of love to life, people, and landscape. It is the artists inspiration and the inspiration of the artist. The Oil-Painting-on-Canvas website is dedicated to artists, who are inspired by love; and who as well inspire people to love. Remy Champt"s exquisite paintings of Great Lakes Boats A site with impeccable renderings of lovely antique boats. "This site contains the Maritime Art of Marine Artist Remy Champt. While Great Lakes Steamers from the late 1800 and early 1900 are my specialty, I paint and produce Limited Editions Prints of many other vessels and related objects including Lake Boats, Sailing Ships, Schooners, Yachts, Steam Engines, Trains, Etc." Remy Champt. Claude Monet, links to many interesting sites about his life and work. Peter Weltons watercolors are great! Jack and Susie.com Five generations of stitchers from Oregon to Colorado share their work, hints and tips, and favorite projects! A friendly community of needlework artisans. Bulletin boards, chat room, projects, files and fellowship. Lot's of great gift ideas! A Love For Art Specializing in nature paintings, bird art, landscape paintings, flower art, floral artwork, garden paintings, animal art, pet portraits. Free special reports on home decorating and interior design. Creative writings and poems. Scandinavian Photography is an on location photography business specializing in wedding photojournalism and portrait studies of children and families throughout New England. Commercial work is also available. Hours by appointment or by Chance. Owner and artist: Erik Johnson. The Magical World of Horses The equine art of Suzana Stojanovic Suza an artist. Original oil on canvas and pastel paintings. Horse portraits, landscape. Realism, photorealism, hyperrealism. Veronica Knight A very fine painter of portraits and other subjects. Robert Lorenson, Sculptor Informative and photographic sculpture site for internationally recognized sculptor Rob Lorenson. Rob works primarily in stainless steel. Rob has a extensive resume of exhibitions and commission throughout North America.